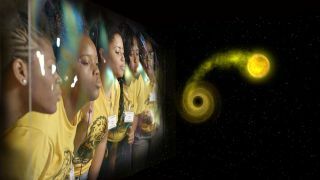 Bridging the gap between the special language of astrophysics and the curiosity of bright young students. Kai Staats is a writer, filmmaker, and former CEO of a Linux OS company. He is now pursuing his MSc in Applied Mathematics at UCT / AIMS, Cosmology Research Group, South Africa. He contributed this article to Space.com's Expert Voices: Op-Ed & Insights. In 1915, Albert Einstein presented his theory of general relativity. He predicted that massive, compact, accelerating objects would cause ripples in the fabric of space-time — gravitational waves. And yet, he believed they were far too weak to ever be detected. Even if generated by the most massive objects in the universe, gravitational waves would require incredibly sophisticated, sensitive instruments that in his day were science fiction. One hundred years later, following more than two decades effort, the U.S. National Science Foundation's Laser Interferometer Gravitational-wave Observatory (LIGO) is nearly ready to come on-line in its search for cataclysmic events in distant galaxies. As a filmmaker, I have had the great fortune of producing two films about LIGO, and through those projects, come to a much deeper understanding of the science and human drive required to undertake such an effort. In producing the first film, "LIGO, A Passion for Understanding" for the LIGO Collaboration and Caltech, I was given the challenge of sharing the enthusiasm and dedication of those who have dedicated their careers to a project, which is not guaranteed success, for the search for something Einstein himself thought impossible. However, the first film did not convey how that passion and knowledge has been transmitted across multiple generations of scientists, for more than twenty years. Beyond the HOWTOs and User Manuals and myriad documents on multiple servers, I set out to discover how the human experience of science research goes beyond what we store in our digital archives. When I first brainstormed this film with Marco Cavaglià — a detector characterization scientist at LIGO-Livingston and a professor at the University of Mississippi — we half jokingly considered an opening with Cavaglià's arrival to the LIGO-Livingston Observatory on his Harley Davidson. Michael Landry, a lead scientist and project manager at LIGO-Hanford, an equally avid motorcycle enthusiast (of the racing variety) was included in the email thread. He responded, "As for Marco, he rides an *American* motorcycle. What self-respecting consigliere rides a quivering, unbalanced, push-rod behemoth with a 1940s tractor engine? Fear the quiet Canadian on the Italian bike!" That sealed the deal. We would open with an Italian on an American bike. I was intent upon "LIGO Generations" being edited to an authentic Louisiana score. Yes, many films have played upon the music of New Orleans, but how many presented a century of blues and jazz while teaching about gravitational waves? When Gabriela Gonzales, spokesperson for the LIGO Collaboration, Cavaglià and I wrote the script for the animated sequence in which Gaby describes the various types of gravitational waves, I envisioned a voyage from a nearby galaxy back to our home planet, from the source of the waves to our solar system. How could I begin with a supernova and arrive on a motorbike? This would not be easy, I knew, for twice the budget of the entire film would not be enough to hire a VFX artist to produce such a visual odyssey. I downloaded and tested a half-dozen solar system, galaxy and universe simulators, software that enables a user to move about outer space with almost no limitation. Some of these applications evolved from software designed to run a planetarium show while others are built upon game foundations. Universe Sandbox, Digital Universe, and Celestia were the final contenders. In the end, Celestia offered the most flexible engagement of our galaxy with readily available plug-ins for hi-res texture maps, 3D models of most of NASA's satellites and probes (and just in case, the spacecraft from 2001: A Space Odyssey), and the ability to fly-by-wire without first learning a scripting language. With screen capture switched on, I was completely immersed for two consecutive days, zipping around our solar system, in and out of the Milky Way. I flew by dozens of binary star systems until I found one that danced as I had envisioned. I explored the moons of Jupiter (just because they are there) and caught up with Voyager as it raced out of our solar system. Despite Celestia having not been maintained for a number of years, showing signs of a disinterested community, I was lost in its 4D magic, totally engrossed. Do you recognize the satellite in orbit around the Earth before we transition to the time lapse from ISS? That is a 2D silhouette, skewed and rotated, built from a photograph I found in the NASA archives of a 3D model made of aluminum foil and paper. Another half dozen hours lost to the realm of the imagination and what might be. Along with my audio engineer and talented recording artist Joe Chilcott (the one who gets shrink-wrapped in the LIGO Science & Education Center in the film), I spent six weeks in negotiation with the big three music rights holders in attempt to license just one Louis Armstrong song. Our entire budget was threatened by the musical score alone, so we turned to creative solutions. We found Jacob Dupre, a fifth-generation New Orleans musician and composer and through the hands-on team at Audio Network, a full century of Louisiana scores. I assigned Chilcott the task of recording the 18th-century "St. James Infirmary" (made famous by Louis Armstrong in the early 1900s) in two variations: A live band recording in the traditional form (during the film's time lapse interlude which begins with the camera in the bayou); and a future version that sounds as though it could double as an element in Vangelis' Blade Runner . In that capacity alone, Joe blew me away. But just two weeks before we went live, I ventured to Wikipedia to read-up on the history of the famous "St. James Infirmary" only to learn the lyrics were about dying of venereal disease. So cold, so sweet, so fair. Saw a field of stars. So serene, so bold, so far. Why "Farside"? Read Ben Bova's sci-fi novel by the same title and you will enjoy the bridge from modern radio astronomy, to LIGO, to the potential future of even more advanced astronomy and the search for life on other planets. This is what makes filmmaking so engaging, so enjoyable. It's not just computer generated special effects, it is human stories brought to life by what we as humans do best — find solutions to complex, challenging problems. Our efforts to do this film right were but a minute reflection of what the LIGO team has worked on for nearly thirty years. They have developed an entire field of physics in order to prove a mathematical formula, to see the cosmos in a whole new light. As Anamaria, one of the LIGO scientists in the film, closes her interview, big science projects are a demonstration of what humans can do when we set aside personal differences, when we focus on one positive, impossible challenge, and do it right. In the opening days of shooting I had the great fortune of sitting with Rainer Weiss, one of the founding generation of LIGO scientists (formerly involved with the Cosmic Background Explorer (COBE) and the successful, first mapping of the cosmic microwave background (CMB)); and his former student and second generation LIGO scientist Nergis Mavalvala, one of the most intelligent, energetic and passionate people I have come to know. The four of us (including Tom Kearney, my Boston location 2nd camera) went kayaking. Rainer and Nergis were busy demonstrating wave cancellation theory across the bow of their boats while I did my best to not fall overboard with my rather pricey digital film rig. Those two days at MIT alone generated ample footage for a short documentary. Yet, there was far more to come. I arrived at LIGO-Livingston just 48 hours after the first "lock" of Advanced LIGO — the first time the Commissioning Team was able to bring the laser interferometer configuration into alignment and hold it, for forty minutes (if I recall correctly), until a minor earthquake in Japan knocked it out again. The process of gaining lock was far from automatic at that time, so it was the finesse of the LIGO scientists and Commissioning team members the pilots of LIGO: Denis V. Martynov, Rob Taylor, Valera Frolov, Ryan DeRosa, and Anamaria Effler as much as the servo motors and automatic feedback loops which enabled such a feat. Ultimately, the Commissioning team is working toward an automated system which auto-corrects and aligns the mirrors with limited human intervention. The time lapse shot from the LIGO rooftop clearly shows heavy fog coating my lens UV filter faster than I could wipe it clean. I slept atop the roof that night (as they say, "It is easier to get forgiveness than permission") in order to capture the stars overhead and enjoy being outside again. While I would have preferred the grass far below, I figured the chance of being woken by a crocodile was less likely ten meters off the ground. While at Hanford I was given the unique opportunity to capture aerial footage while flying with Alexa Staley — LIGO Hanford scientist and Columbia University graduate student — on one of her training flights, at Livingston I purchased a quadcopter "drone" to which my audio engineer Joe and I attached a GoPro camera. We were filming within an hour of some-assembly-required, the wind buffeting the rotors, threatening to toss the airborne robot into the trees. Having never flown a drone before, I feel lucky to have crashed only twice — once by launching from a covered balcony, out … out … over a pond … and into a tree. Joe and I found a ladder and were back in business ten minutes later. The second crash happened just shortly after nearly losing the chopper to the backdrop of the sun, hundreds of feet off the ground and far over the tall, dense Louisiana trees. I called it back over the main road where Cavaglià had just seconds before ridden his motorcycle for the opening scene, when I over-corrected and splashed the drone into the swamp alongside the road. I took off my shoes and socks and rolled up my pants to walk through the ooze and mud to retrieve the drone. Just then, Joe Gaime, the observatory director drove by, stopped, reversed his car and got out. Shaking his head, smiling, he said, "Well, it's not every day we see something like this at LIGO." I was embarrassed. Cavaglià was laughing. I think I said something like, "I, uh, … I really get into my films," at which point he returned to his car and drove off. Having watched the pre-release draft of the film Gaime sent an email saying he wanted to buy a drone. In the 'family portrait' scene in “LIGO Generations,” where I interview LIGO co-founder Rai Weiss and three subsequent generations of scientists who work at LIGO, the next generation is being inspired just across the way at the LIGO Science Education Center (SEC). This facility was funded as part of the LIGO project, as a hands-on science center for the regional schools. Classes tour the LIGO operations center and spend time in the science center, often gaining a first-time experience in interactive learning. What's more, teacher training courses provide instructors with a wealth of information and experience which they take back to their classrooms. The intent is to give learners the kind of motivation that will inspire them to consider a further education, perhaps a career in science. Since childhood, when my parents took me and my brother through interactive science museums while we traversed the country in our Volkswagen van, I had always wanted to spend the night in a science museum. While the LIGO Science Education Center did not have dinosaurs doing battle nor iconic figures leading a charge, the science exhibits did come to life. My audio engineer and I shot close-ups of nearly every exhibit, not knowing which would be used in the final edit. I have to admit, it was not only filming, but learning too. I allowed myself to become a child again, to see the world through the excitement of observing. While I was careful to not make this film entirely about education, I do have ample footage for just such a documentary. William Katzman , Kathy Holt, and Tien's Huynh-Dinh, all instructors at the LIGO SEC, share a passion for teaching which goes beyond the classroom. They engage educators and learners alike, over and over again sharing the exhibits as though they were just installed that previous night. Take a look at Dinh's desk (which is not unlike Holt's or Katzman's) and you will see what it means to never grow up. There is a kind of magic in science that is just as exciting as the stuff of storybooks, because it can be reproduced and experienced over and over again, for people of all ages to understand and share. For as much as technological advancements and scientific discovery open new doors for all of humanity, it is the incredible passion with which science can and should be taught that gives me true hope for our species. In teaching science, we are not just sharing facts and figures, but giving learners the tools for deductive reasoning, to make decisions based upon what they see, experience, and measure in order to overcome fear, dogma and superstition. I hope to be on campus, at Hanford or Livingston, when detection of a gravitational wave is confirmed. I can only imagine the excitement and relief of a vision come to fruition after nearly three decades. That gives a whole new meaning to "big science" and to the dedication of the generations who share a passion for understanding.